Militants have been holding 21 Egyptian Coptic Christians in Libya for weeks. CAIRO -- A video purporting to show the mass beheading of Coptic Christian hostages was released Sunday by militants in Libya affiliated with the Islamic State group. The killings raise the possibility that the Islamic militant group - which controls about a third of Syria and Iraq in a self-declared caliphate - has established a direct affiliate less than 500 miles (800 kilometers) from the southern tip of Italy. One of the militants in the video makes direct reference to that possibility, saying the group now plans to "conquer Rome." "These cowardly actions will not undermine our determination" said el-Sissi, who also banned all travel to Libya by Egyptian citizens and said his government reserves the right to seek retaliation. "Egypt and the whole world are in a fierce battle with extremist groups carrying extremist ideology and sharing the same goals." The Coptic Church in a statement called on its followers to have "confidence that their great nation won't rest without retribution for the evil criminals." 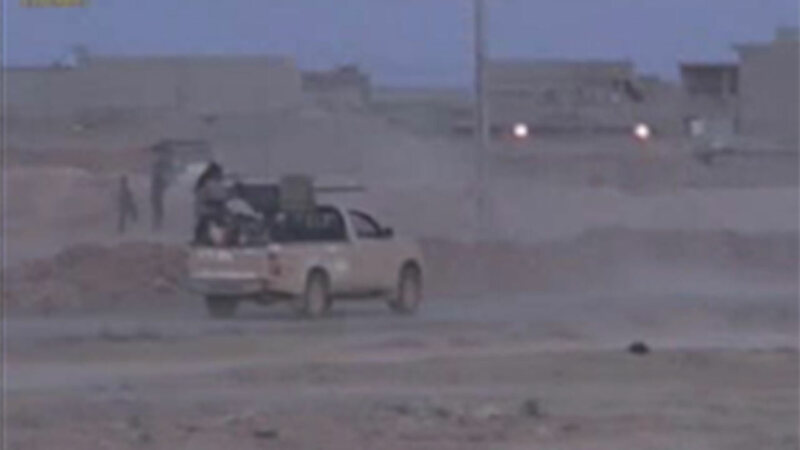 The video's makers identified themselves as the Tripoli Province of the Islamic State group. A still photo, apparently taken from the video, was published last week in the Islamic State group's Dabiq online magazine - indicating a direct connection between the Libyan militants and the main group. The video, released Sunday night, depicts several men in orange jumpsuits being led along a beach, each accompanied by a masked militant. The men are made to kneel and one militant, dressed differently that the others, addresses the camera in North American-accented English. The men are then laid face-down and simultaneously beheaded. The militant speaker then pointed northward across the red-stained waves and said, "We will conquer Rome, by Allah's permission." In el-Aour, a dusty and impoverished village some 200 kilometers (125 miles) south of Cairo and home to 13 of the hostages, friends and family assumed the worst as soon as the photo was published on Thursday. On Saturday, two days after the photo appeared, the community was wrapped in sorrow. Men covered their heads with dirt in a sign of both grief and shame. Women slapped their own faces or let out heart-wrenching shrieks of pain. Villagers accused the Egyptian government of doing little to help the captives. The authorities, they say, were able to free Muslim Egyptians abducted in Libya in recent months but have done nothing to save the 21 because they are Christian - an accusation rooted in the deep sense of religious discrimination felt by most Egyptian Copts. Samuel Walham's family immediately recognized him from the picture, showing him kneeling on the beach alongside four other hostages - each flanked by a knife-wielding militant. "Look at my love. Look how beautiful he is," Walham's mother, Ibtassal Lami, said through tears as she cradled a photo of her son and women wailed in the family's ramshackle, two-story home. "He only went there to earn his living." Libya, rich in oil and short on labor, has long been a magnet for Egyptians from all professions. Laborers have flocked there to escape poverty and unemployment at home, while professionals have gone in search of a better salary. Libya's 2011 civil war left much of the country in ruins, creating a boom for skilled foreign workers. Egyptians have jumped at the opportunity: they are the largest single group of foreign workers in Libya. But over time, the risks have grown for those looking to Libya for a better paycheck. Egyptians, and Copts in particular, have become frequent targets for Islamic extremists who have flourished amid Libya's political turmoil. Islamic and tribal militias have overrun Libya's two largest cities, Tripoli and Benghazi - forcing the elected Western-based government and parliament to meet elsewhere. Egyptian authorities have responded by suspending most flights to Libya and issuing travel warnings. Yet, Egyptian workers remain undeterred, and still line up outside the Libyan Embassy in Cairo in search of visas. It was there that Walham was kidnapped on Dec. 28. Six days later, gunmen seized another 13 Egyptian Christians from Sirte in a targeted raid on a housing compound for laborers. Abanoub Ishaq, a 19-year-old worker from el-Aour, was there the night the militants burst in just before dawn, knocking on doors with a list of names. Those who answered were hauled away, Ishaq said. He managed to evade capture by remaining silent after receiving a phone call from a Muslim neighbor who warned him not to open the door because militants were searching for Christians. "We heard nothing but my friends' screams, then they were silenced," he told The Associated Press. The video at the end makes reference to the case of Camelia Shehata - a longstanding rallying point for Muslim fundamentalists. Shehata is an Egyptian Coptic woman who went missing and was rumored to have converted to Islam to escape an unhappy marriage to a Coptic priest. The Coptic Church bans divorce. Shehata was eventually found by Egyptian police and returned to the Church and promptly disappeared from public view. Her case became a rallying point for fundamentalist Muslims, who regard her as a Muslim being held prisoner by the church. Salafist Muslims in Alexandria held weekly rallies on her behalf throughout 2010, and Shehata's case is believed to be one of the motivations for a deadly bombing of a Coptic church in Alexandria on New Year's Eve 2010. As the men are being beheaded, a subtitle on the video declares: "This filthy blood is just some of what awaits you, in revenge for Camelia and her sisters."